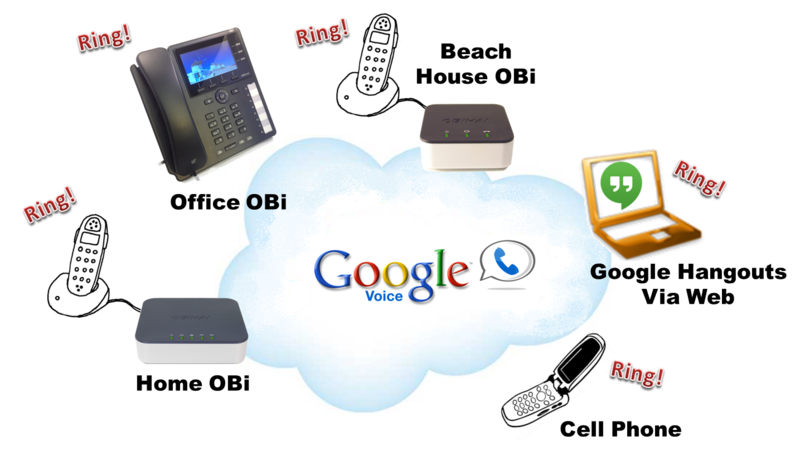 Did you know you can use a single Google account on multiple OBi2 (OBi200 and OBi202) universal adapter devices and OBi1000 IP phones...and on incoming calls, all of your OBi devices' will ring? When somebody calls your Google Voice number, not only will the regular land line and/or mobile phones you have set-up in your Google Voice account settings ring, but phones attached to your OBi2 Series VoIP phone adapters and your OBi1000 Series IP phones will ring as well. To use this feature, use the OBiTALK web portal to set up two or more OBi2 Series or OBi1000 Series VoIP devices with the same Google account. You may also use Google Hangouts on your computer as a Google Voice endpoint. This endpoint will also ring when someone calls your Google Voice number.